You’re invited to Farm Day in the City presented by the PEI Potato Growers, one of the most magical, fun and delicious days of the year!! Join farmers, producers, hot food purveyors, crafters and artisans from across Prince Edward Island for the Island’s largest outdoor market and street festival of the year, featuring over 165 vendors and exhibitors! 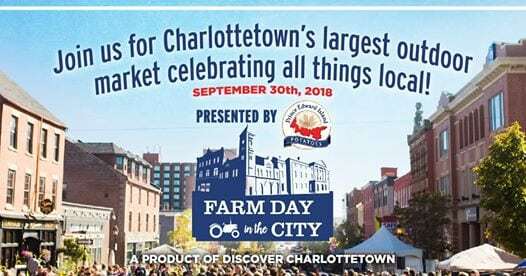 Celebrate the Island’s bountiful harvest and the ‘buy local’ culture at this open-air market that takes over lower Queen Street (from Grafton to Water) and Victoria Row in the heart of historic downtown Charlottetown. Plan to spend your day exploring the market and enjoying the many free activities taking place throughout the day, including live music on two stages, a petting zoo, kids’ activities, and a good ol’ fashioned pie-eating contest in support of local charities. Farm Day’s presenting sponsor, the PEI Potato Growers, will also be on-hand celebrating the Island’s famous spuds with interactive games, a potato peeling contest and, of course, their much beloved ‘fry truck’, with proceeds from the sales going to a number of local chairities and non-profit organizations. Check out our blog for top tips on how to experience the PEI Potato in all its glory!